The presentation commissions new work and performances by Henry Andersen & Bryana Fritz/Slow Reading Club (Australia, USA), Lila Athanasiadou (Netherlands), Jasmin Blasco (France/USA), Dimitri Chamblas (France), François Dallegret and François Perrin (France), Milka Djordjevich (USA), Daniel Frota (Brazil), Mark Geffriaud (France), Gerard & Kelly (USA), FLAX Artist-in-Residence Aurélie Godard (France), Jeff Guess (France), Simon Leung (USA) and Luke Stoneham (UK), and Lucky Dragons (USA). It will be accompanied by a program of historical performances including works by Merce Cunningham and Trisha Brown and interpretations of scores by Fluxus artists or those associated with Fluxus—Alison Knowles, Yoko Ono, Alvin Lucier, Pauline Oliveros—by CalArts students on the CalArts Nomad Floor. The floor will play the role of a contemporary House of Dust as a studio, gathering place, gallery, blank slate, habitat and point of discussion about context, performing and witnessing performance, open to anyone upon registration to the MAK Center. In 1967, Alison Knowles’s The House of Dust started as one of the first computer-generated poems. Each quatrain began with “A House of . . . ” followed by random sequences of materials, sites or locations, light sources, and categories of inhabitants. In 1969, Knowles translated one of the quatrains into an architectural structure with organic, “non-Euclidean” shapes that, at the time, were in contrast with the technological origin of the poem. 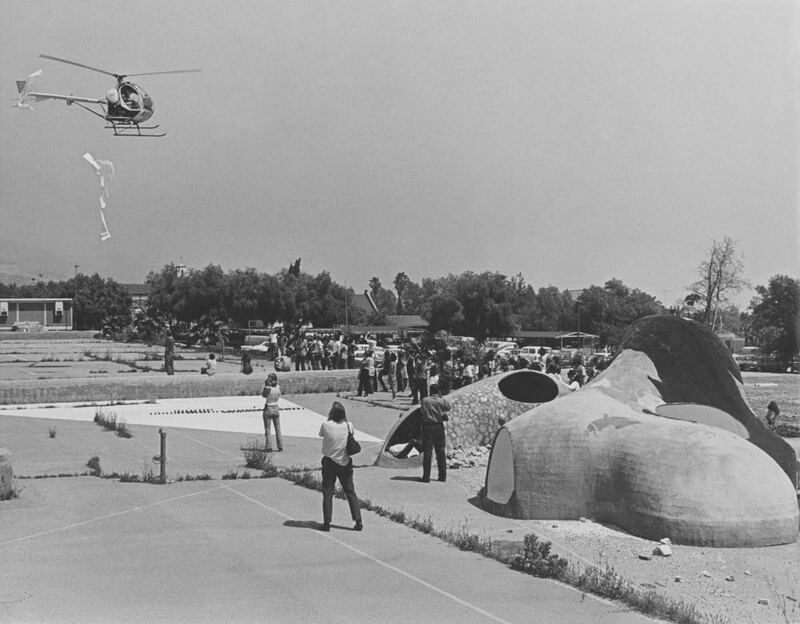 The house was first installed in Chelsea, New York, and then moved to CalArts, where a burgeoning community of artists and students created a number of artistic works in response to the structure (installations, performances, dance, concerts, poetry classes, etc.). The physical House thus became an open structure, a platform used to generate and shelter experimental activities. Lost in the 1980s, the only remaining aspect of the work is the poem, which is now reconstituted and open to new interpretations.